If California were a country, it would rank 34th in the world by population and 8th by the size of its economy—big enough for a seat at the G8. But that’s not the whole story. 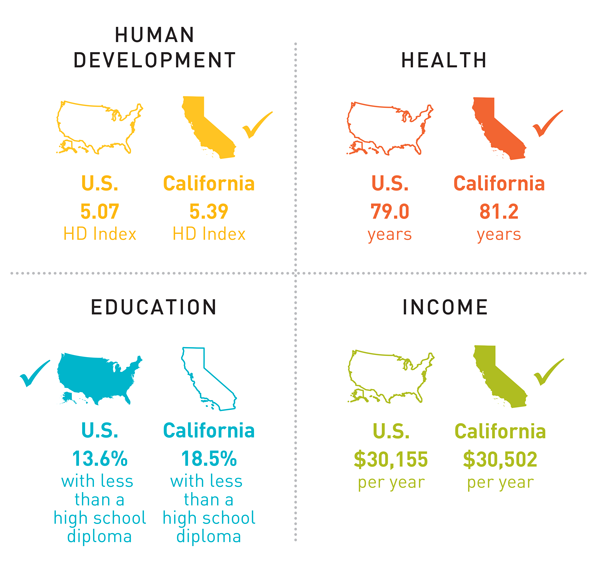 Instead of relying only on economic analysis, Measure of America’s A Portrait of California uses the human development approach to tell us how people are doing. Three dimensions—a long and healthy life, access to knowledge, and a decent standard of living—are examined in detail and presented along a simple ten-point scale: the American Human Development (HD) Index. Income inequality is in the headlines these days, and attention to this huge and growing problem is welcome. But to focus on inequality in income alone is to take a narrow view of the problem and what’s at stake. Mutually reinforcing inequalities in health, education, environment, neighborhood conditions, wealth, and political power have created an opportunity divide that higher wages alone cannot bridge. 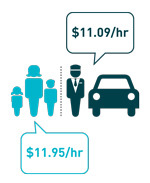 On average, parking lot attendants earn about the same mean hourly wage as childcare providers. The pay in the childcare sector is far too low to attract most skilled workers. 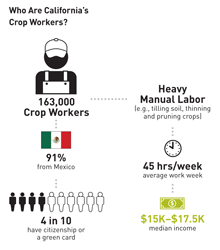 Despite generating net farm profit of over $16 billion in 2012, California's 163,000 farm laborers struggle to put food on the table for their families, even when working long hours on physically demanding jobs. 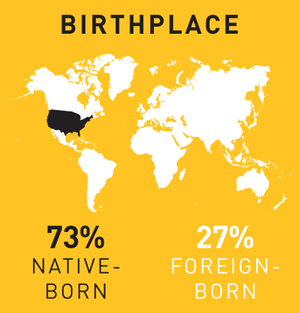 California has more foreign-born residents than any other state; it is home to one-quarter of America's foreign-born population. Californians live longer and earn more than the average American, but the state also faces some significant challenges that limit people's abilities to live freely chosen, rewarding lives and position their children for the same. outcomes from one place to another and to look at changes over time. The result is a comprehensive reference tool and a critical starting point for informed discussions on policy solutions. Inequalities in health, education, and earnings divide California communities in ways that challenge conventional north-south and inland-coastal divisions in the state. By using the HD Index score to sort county, town, and neighborhood clusters,we have identified “Five Californias,” each with its own distinct well-being profile. 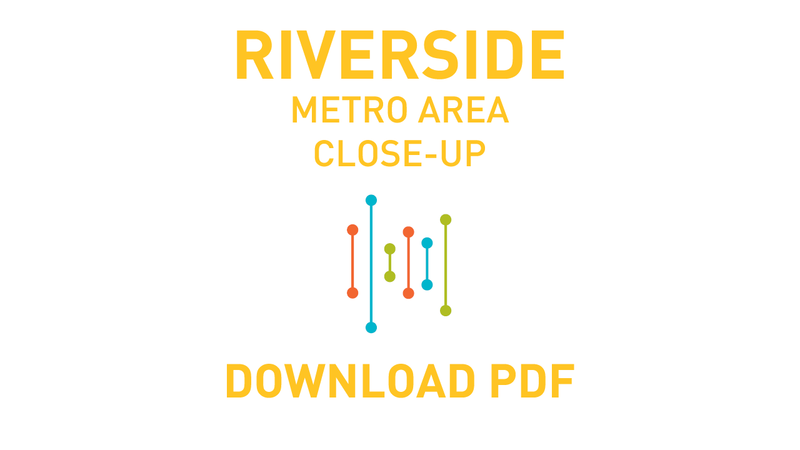 One Percent California consists of the two neighborhood clusters that score 9 or above out of 10 on the HD Index; these neighborhoods are home to just under one in every one hundred Californians. Elite Enclave California is made up of neighborhood clusters that score between 7 and 8.99 on the Index; 15 percent of Californians are part of this group. 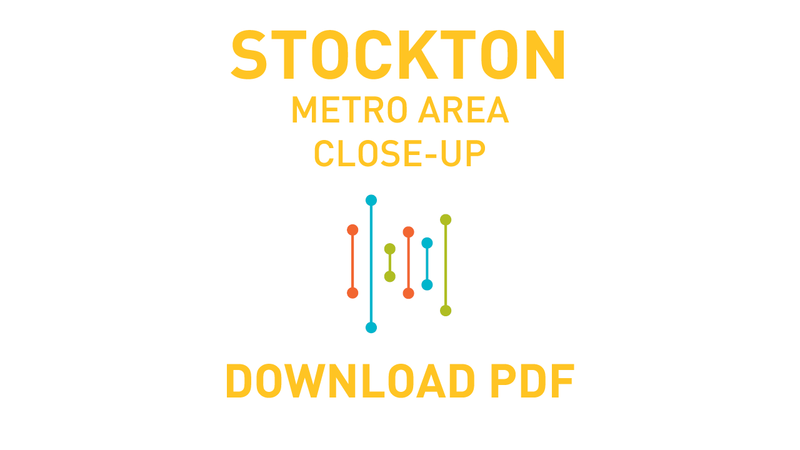 Main Street California comprises neighborhood clusters that score between 5 and 6.99 and is home to 39 percent of Californians. Struggling California is home to the largest share of the state’s population, 42 percent, with these neighborhood clusters scoring between 3 and 4.99 on the Index. Disenfranchised California comprises neighborhood clusters that score below 3 on the HD Index; this California is home to roughly 3 percent of the state’s population. 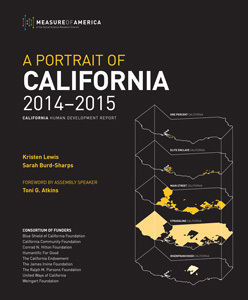 The Five Californias also gives us a window into California’s future. The HD Index numbers make plain the need to address the future of the state in two ways: by preventing problems from taking root in childhood and by helping parents. Together, Struggling and Disenfranchised California are home to almost half the state’s population and to more than half (50.9 percent) of the state’s children. 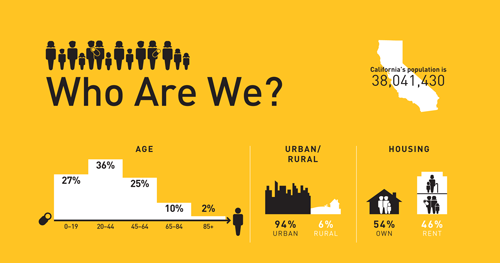 In Struggling California, nearly one in five teens and young adults fall into the “disconnected youth” category, or youth ages 16 to 24 who are neither working nor in school. 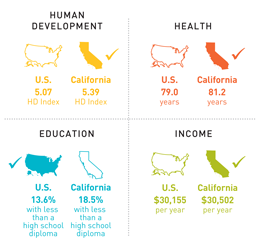 Though California made substantial human development progress from 2000 to 2005, the state has been treading water in terms of well-being since 2005; the HD Index score was 5.39 on this ten-point scale in 2005 and again in 2012. The state’s HD Index score exceeds the national average (5.07), but scores by county, metro area, and neighborhood cluster reveal large variations in fundamental health, education, and earnings outcomes within the state. The greatest geographical variations are often found within, rather than between, counties and metro areas. 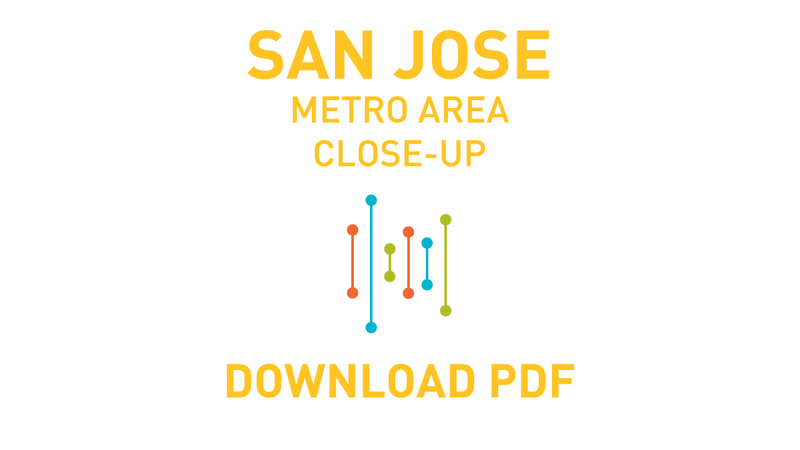 Of the state’s ten largest metro areas, San Jose tops the well-being chart, with an HD Index score of 7.08, higher than the top-ranking state, Connecticut. At the other end of the rankings table is Bakersfield, with an Index score of 3.69, lower than the worst-performing state, Mississippi. 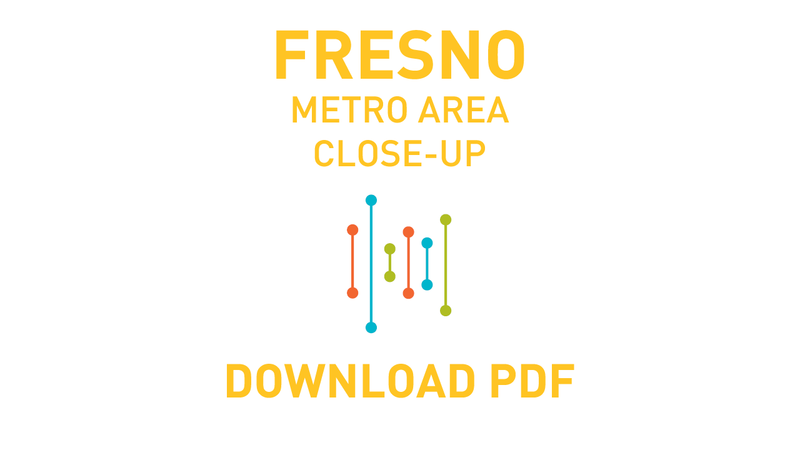 Fresno ranks ninth, with an Index score of 3.96—on par with well-being levels in West Virginia. Health is a good news story from 2000 to 2012: life expectancy at birth in California increased by 2.7 years to 81.2 years. Californians live longer than the average American, ranking fourth among states on this fundamental indicator. But at the neighborhood level, the story changes. 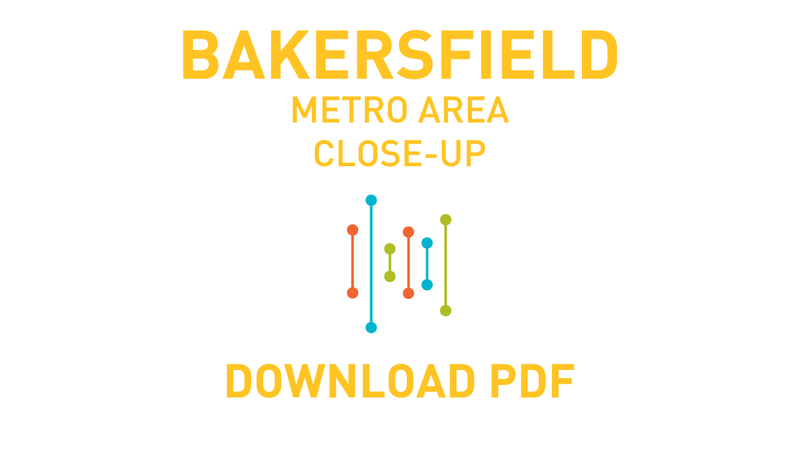 Nearly a dozen years separate the top and bottom neighborhood clusters in California, from a life expectancy of 87.0 years in parts of northwest Santa Clara to 75.3 years in Twenty-Nine Palms City and Barstow City in San Bernardino County. 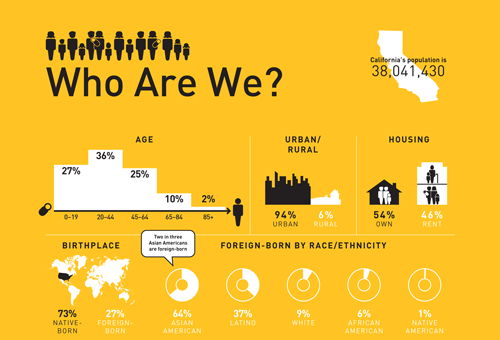 By race and ethnicity, Latinos outlive whites in California by 3.6 years. African American men have the lowest life expectancy of all race, ethnicity, and gender categories, 72.8 years, just under the male life expectancies of Tunisia and Vietnam. This is in part the result of tragically high premature death rates among men due to heart disease, homicide, and cancer. More education is associated with a range of positive outcomes that extend well beyond better jobs and bigger paychecks. Measure of America’s research suggests, for example, that if every Californian adult were to magically “move up” just one education level, nearly 1 million fewer Californians would live in poverty, life expectancy would increase by 1.6 years, 1,200 fewer Californians would be murdered each year, and 2.4 million more Californians would vote in elections. Change in educational attainment since 2000 has been very positive. A higher percentage of Californian adults 25 years and older hold bachelor’s and graduate degrees than they did in 2000, and the share of adults who lack a high school diploma fell from 23.2 percent in 2000 to 18.5 percent in 2012—though that rate is still about 5 percentage points higher than the national average. Latinos have the lowest educational attainment score, lagging in school enrollment for those ages 3 to 24 as well as in the proportion of adults who have completed high school, a bachelor’s, and a graduate degree. 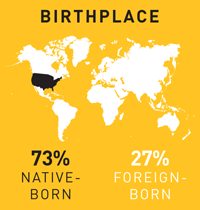 However, U.S.-born Latino adults are slightly more likely than the average Californian to have graduated high school, a trend that bodes well for Latino educational levels in the next generation. The youth disconnection rate (the share of young people ages 16 to 24 who are neither working nor in school) is cause for concern. 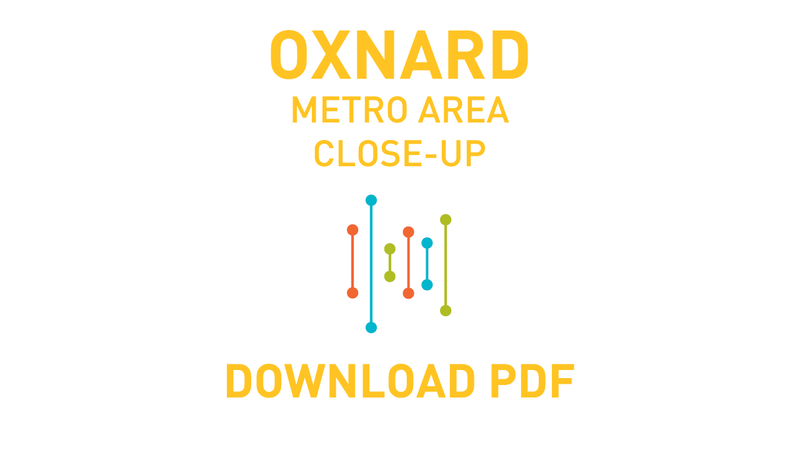 In the ten most populous California metro areas, the rate ranges from a low of 10.4 percent in Oxnard–Thousand Oaks to more than double that, 24.2 percent, in Bakersfield. More striking still is the youth disconnection range within large metro areas by race and ethnicity. What has stymied overall human development progress in recent years? The culprit is the decline in earnings. 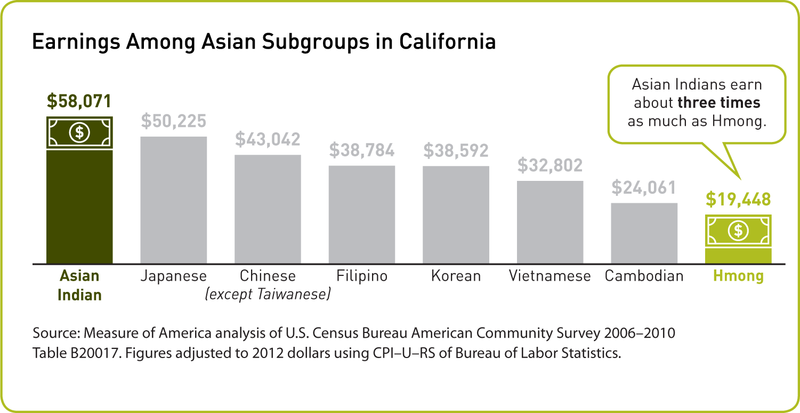 California’s median earnings in 2005, $33,305, were 16 percent higher than they were in 2012. Median earnings are the wages and salaries of the typical worker. 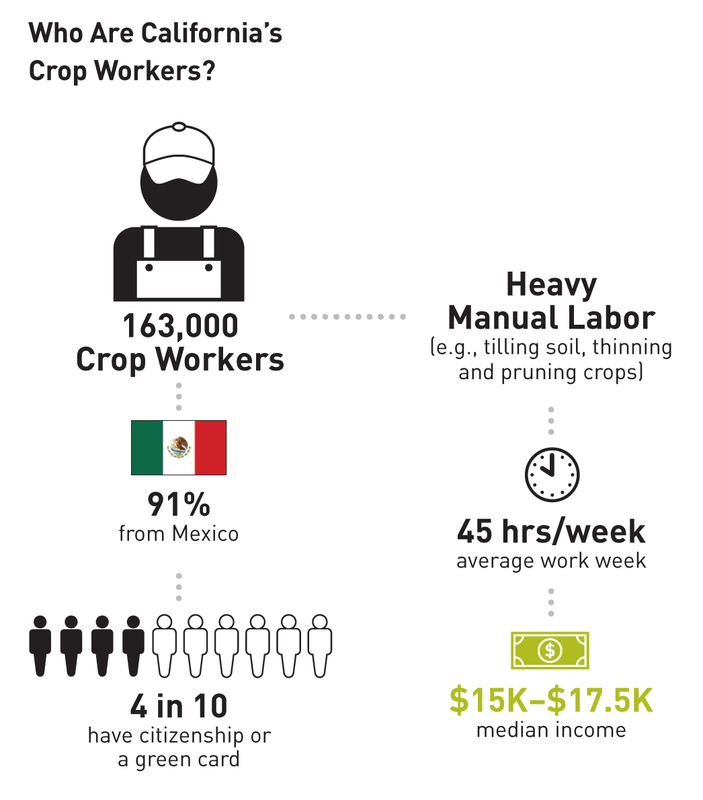 California’s agriculture feeds the nation, but the state’s crop workers struggle to buy groceries, with annual earnings that range from $15,000 to $17,500. 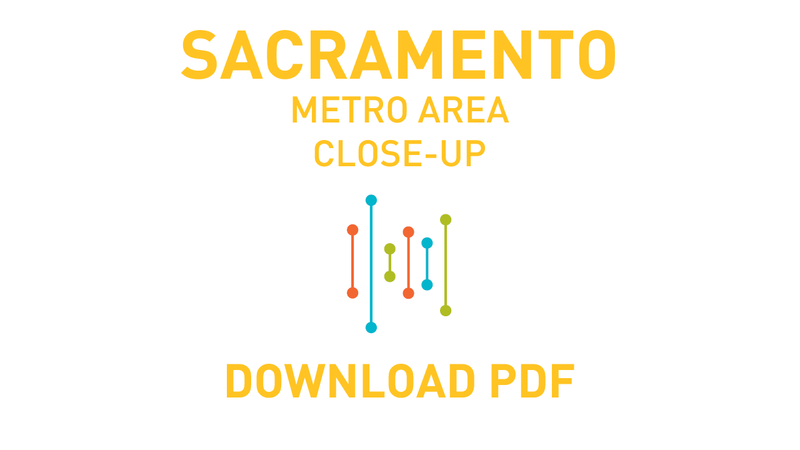 Median earnings by metro area range from San Jose, at over $42,000 to Fresno, with earnings of under $23,000, slightly more than half what the typical San Jose worker is earning. White men outearn white women by almost $18,000. 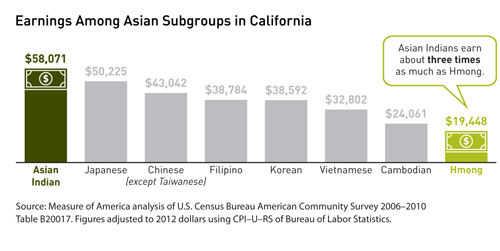 The gender pay gap for the state’s other major racial and ethnic groups ranges from about $4,000 between Native American men and women to a gap of about $10,000 among Asian Americans. 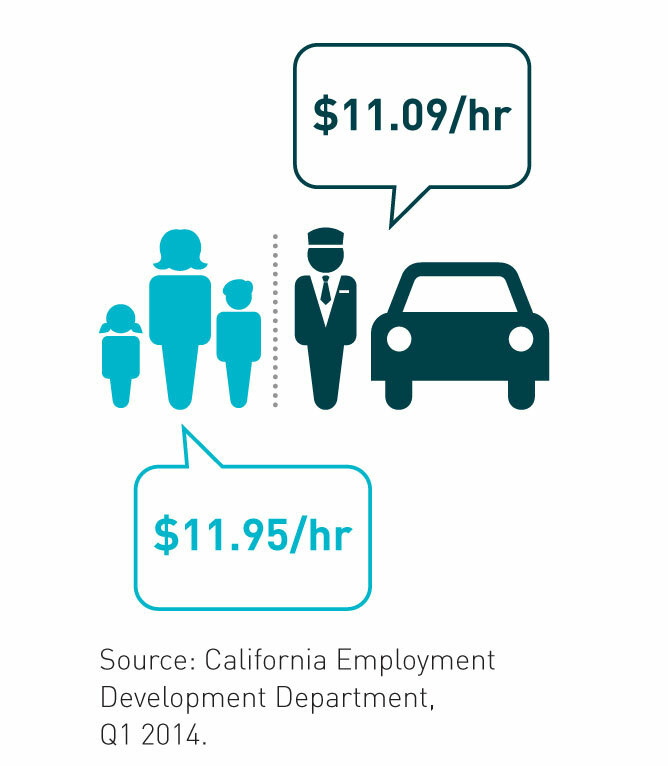 Wage inequality is not just a women’s issue; most California families depend on women’s earnings to make ends meet.